China’s yuan eased on Friday and was on track to extend its longest losing streak on record to nine straight weeks as the dollar climbed and investors worried about slowing growth at home and abroad as trade tensions deepen. The yuan has weakened 6.3 percent against the greenback since mid-June, rekindling memories of China’s “one-off” devaluation in 2015 that shocked global markets. While traders believe the risk of a similar sudden devaluation in the yuan is unlikely for now, both Washington and Beijing appear to be digging in for a protracted trade battle that will keep pressure on the currency and the Chinese economy. Prior to market opening on Friday, the People’s Bank of China lowered the midpoint rate to 6.8395 per dollar, 78 pips weaker than the previous fix of 6.8317. In the spot market, the onshore yuan slid 0.3 percent. It opened at 6.8355 per dollar and was changing hands at 6.8377 at midday, 197 pips weaker than the previous late session close. If the yuan finishes the late night session at the midday level, it would have lost 0.13 percent to the dollar for the week, extending its longest weekly losing streak since the exchange rate was unified in 1994. 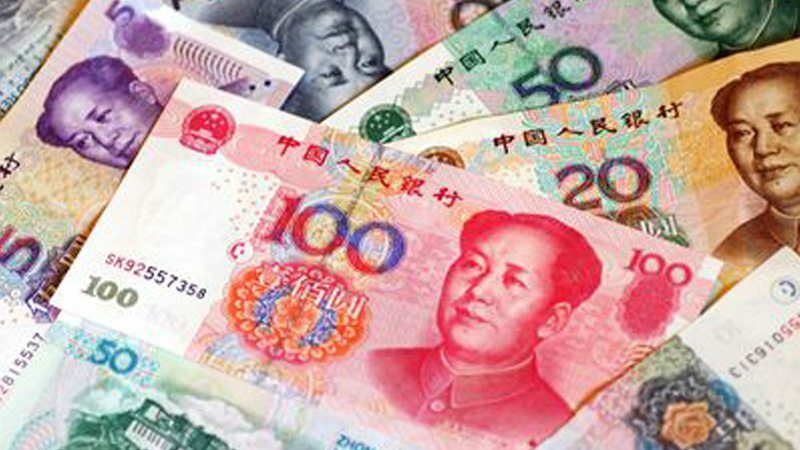 So far this year, the yuan has shed 4.8 percent against the dollar. Traders said the yuan did not stray much from its midpoint fixing level on Friday morning, compared with intraday moves of hundreds of pips seen in the past few weeks. While neither Washington and Beijing show any sign of compromise in the trade dispute, and more sweeping tariffs are set to take effect within weeks, Chinese forex traders have grown more cautious since the central bank signalled increasing discomfort with the yuan’s recent, rapid decline. Early this month the PBOC made it more expensive to short the currency, reviving a measure last used in July 2017. The global dollar index, a gauge that measures the unit’s strength against six other major currencies, rose to 95.537 at midday, from the previous close of 95.504. The Thomson Reuters/HKEX Global CNH index, which tracks the offshore yuan against a basket of currencies on a daily basis, stood at 93.56, firmer than the previous day’s 93.52. The offshore yuan was trading 0.11 percent weaker than the onshore spot at 6.845 per dollar. Offshore one-year non-deliverable forwards contracts (NDFs), considered the best available proxy for forward-looking market expectations of the yuan’s value, traded at 6.878, -0.56 percent away from the midpoint.